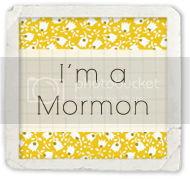 A little 4x6 Handout I made from an excerpt of the talk by President Monson - the full talk can be found HERE. 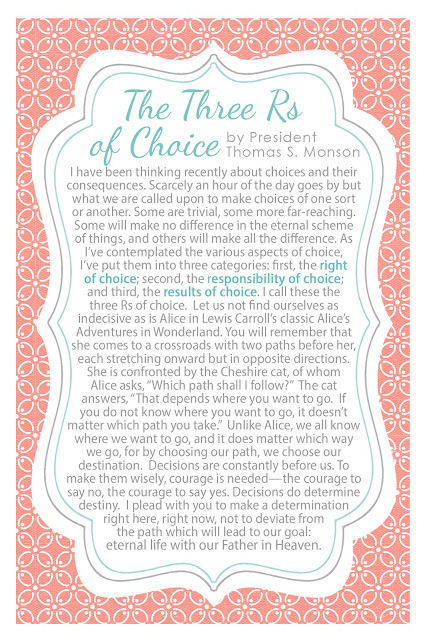 "I have been thinking recently about choices and their consequences. Scarcely an hour of the day goes by but what we are called upon to make choices of one sort or another. Some are trivial, some more far-reaching. Some will make no difference in the eternal scheme of things, and others will make all the difference. As I’ve contemplated the various aspects of choice, I’ve put them into three categories: first, the right of choice; second, the responsibility of choice; and third, the results of choice. I call these the three Rs of choice. Unlike Alice, we all know where we want to go, and it does matter which way we go, for by choosing our path, we choose our destination. Decisions are constantly before us. To make them wisely, courage is needed—the courage to say no, the courage to say yes. Decisions do determine destiny. I plead with you to make a determination right here, right now, not to deviate from the path which will lead to our goal: eternal life with our Father in Heaven." To download just right-click the image and save to your computer. File is for PERSONAL or CHURCH USE only, not for and any commercial purposes.